As remakes started to hit the public, classic horror titles were instantly recognized as definite possibilities for modern updates. Halloween, The Texas Chainsaw Massacre, The Wizard of Gore and even The Omen were chosen as material to be rewritten for the crowd of the new millennium. 1979's When a Stranger Calls was an obvious choice in the height of all the remake attention. It had the familiar presence of a babysitter mixed in with an urban legend and fear of the unknown. Unlike the original, however, which only partly focused on a babysitter receiving disturbing phone calls, the remake would stretch out the eerie beginning into a full length story. But would this be a good idea? Or should small packages be left condensed? An unseen girl is called on the phone at home. On the other line is a stranger; someone who wants to harm her. And they do, resulting in a grisly discovery for the local cops. Miles away in Fernhill, Colorado, Jill Johnson (Camilla Belle) is sulking over her boyfriend Bobby (Brian Geraghty) who betrayed her by making out with her best friend Tiffany Madison (Katie Cassidy, star of the Black Christmas remake). On top of this tragic scenario, Jill has to repay her parents for going over her cell phone minutes by 800, even though it was Bobby who wouldn’t stop calling. Grounded during the night of a party, Jill babysits Will and Allison for the Mandrakis’. Everything is going wonderful at first. The house is huge and expensive, with an indoor pond, automatic lights, window walls and a security system, all overlooking a lake. But when the phone rings, nobody answers once Jill picks up. She passes it by as a friend playing a joke on her, until she receives an answer, perfectly describing what she is doing. There is a stranger looking into the house...or perhaps, he’s already inside! ...I thought wrong. Unless they’re crooks, the Mandrakis family would be paying Jill a hefty amount for her night of child watching. As said in the synopsis, the house is huge, and Mr. Mandrakis is a doctor for crying out loud. Atmospheric with wooden furnishing, it’s a dream villa. Big is nice, but it can also lead to trouble. A large dark house at night is enough to scare a cookie monster into hiding. In the background, when Jill is talking on the phone, you can sometimes see what looks like an outline of a man; a subtle but effective fright. Everything else, as much as you like to watch on, is completely by the book. We have jumping cats, security alarms falsely going off, and for most of the picture, a lot of nothing. It’s very uneventful for the first hour, which without the funky house, would be quite a bore to sit through. It starts off tense, introduces characters, and moves slowly into what one hopes will be a worthy payoff ending. Jill is the best character of the feature, not just because she’s our main final girl, but because she’s practically the only one on-screen. Bobby is rarely seen and Jill’s friend Scarlet (Tessa Thompson) who is likable when we first see her, is really nothing but an extra number for Jill’s address book. There’s only two other people who matter: the stranger, and Tiffany. Tiffany visits Jill at the house she’s babysitting to talk with her about Bobby, because she’s her best friend. Oh Jill, what an idiot. First she snoops around Mrs. Mandrakis’ wardrobe and jewelery, then she gives out the Mandrakis’ number to Scarlet to pass around to others. If anyone should ever happen to come across this young lady, never hire her as a babysitter, or worse, a nanny. It’s one thing to be snoopy and stupid, but respect is required with the job. Somehow, Jill remains a good character, and you feel for her turmoil. “The call is coming from inside the house.” I bet you saw that quote coming as well. Unfortunately, it comes a little late in the movie. Jill has been called a million times, and a few of those calls proved that somebody was stalking her. Smart Johnson calls the cops, and they say that they will be at the house soon. But intelligence can only be maintained for so long when Jill gets the bright idea to check out a light that has been turned on in the guest house. Brilliant move, jackass! She thinks that it may be the maid, Rosa (Rosine Hatem, also a stunt performer for the film). Really? Are you serious Jill, or are we just playing mind games? Well, Jill leaves the children at the house to investigate. A light is later seen in an upstairs bathroom of the house from Jill’s outdoor point of view. Now she thinks that this may be Rosa as well. By this point, the audience is starting to lose interest in mind of our hero. It is now when the police phone Jill back, notifying her that the calls are indeed coming from inside the mega house. If you saw the trailer, you knew this. If you didn’t, you could probably still tell. The When a Stranger Calls remake is mostly a routine of suspense that leads to nowhere. 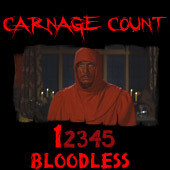 We have a body count, but the method of death is unknown without the blood. Once our heroine figures out that she must get the kids and leave, the killer finally confronts her. He smacks Johnson around for a good portion of the final act, all while the annoying kids cry their eyes out. It’s actually kind of funny, in a dark humor kind of way. In a movie where suspense is everything, it wasn’t very thrilling, or even horrifying. In fact, my favorite part was watching Jill scramble to fix up her mistakes when she first enters the house. The Mandrakis’ have an array of different remotes, some that will turn on blaring music and fireplaces. Will she wake the children? That was my most suspenseful moment. A shame. It’s an alright remake that at least had a purpose. It took the original and tried to improve by expanding the only major effective area of it. Underrated, but nothing spectacular. Sony released this on DVD with deleted scenes, an audio commentary and a Making Of featurette. Don’t judge too harshly. It tries, and it’s never boring. At least, not the first time you watch it. For a fine finale and a weak but passable dream ending, go Rent it!